CAPTAIN has enabled me to stop and think about my clients individually, consider their unique information, and then also be able to understand similarities among my clients. Further, it is a way to easily and quickly access my client’s file and information. As we collect and enter the data for CAPTAIN, a realization, or a snapshot, of the client’s household gives us a unique view of the individual and their circumstances. 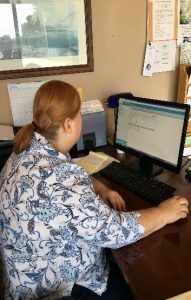 Suzanne Redden, Rogers County Community Services Representative, checks the SIM tab to verify an emergency assistance client is eligible for another of C.A.R.D.’s programs.